I am an idealist with a healthy dose of realism. We can be taken down by the disappointments of our daily lives and the dark forces within them, or the greater world, or we can confront these realities and counterbalance them with creativity and compassion. My idealist nature has opened me up to not just a few tricksters throughout my life, and in recent years, I’ve experienced a not-so-healthy dose of disappointment. It is easy, and human, to become discouraged, to want to disengage as a result. And this reaction very well may be necessary for our own healing and growth. Like a yoga instructor once said to me, “It’s important to open, but you have to close, too.” This was a really important revelation for me. But then you need to find a way to open back up again–to trust, to forgiveness, to acceptance. That is the hard task of living. Cynicism, negativity, rigidity are much easier, but if prolonged, much deadlier states of being. I know I have held on to people or incidents using them to stoke my anger, as proof of what a dismal business any relationship can be. The reality is no matter how generous or kind you are to some people, no matter how authentically you try to conduct your life, you can’t necessarily expect reciprocation, and to expect as much, while only natural, can be a recipe for disappointment. It also leads to a transactional view of the world or relationships (rather than a transformational one) which isn’t healthy or realistic in the long run. What I’ve come to find, rather, is that often you will receive what you need when you need it, and it may be from an unexpected source, at an unexpected time. Sometimes this source is within us, other times it is outside of us. Reminding myself of this on a daily basis is one thing that helps me persevere in my personal and professional realms. It also helps me recognize my own shortcomings and forgive myself when I haven’t directly acknowledged or repaid someone’s kind act. 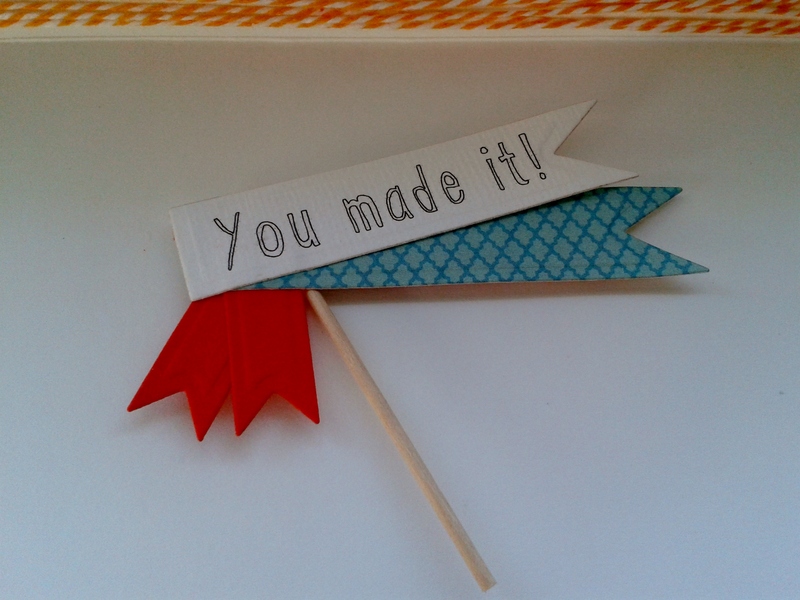 And this weekend in particular gave me pause to reflect on all of this, not only because of the conversations and interactions I had, but also because I received an unexpected gift in the mail from a fellow paper crafter. There are myriad reasons why anyone creates art–for me, one reason is to counteract the ugliness in the world, and sometimes in my mind. It is the same reason why I, and many of us, retreat into nature. Both remind me that the world is a beautiful place and we can have a hand in that beauty. 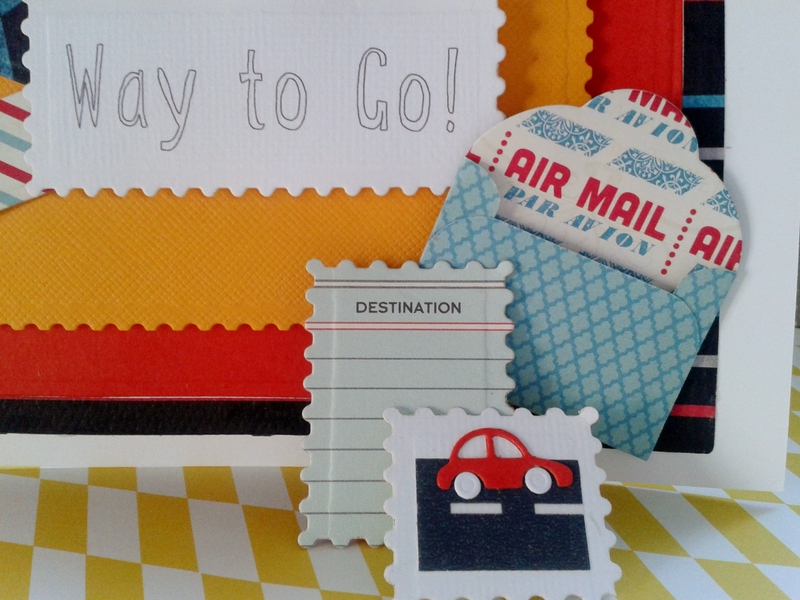 Becoming part of an international group of paper crafters and artists has contributed to that sense as well. So I just wanted to publicly thank Jeanne of A Kept Life for her kind gesture. 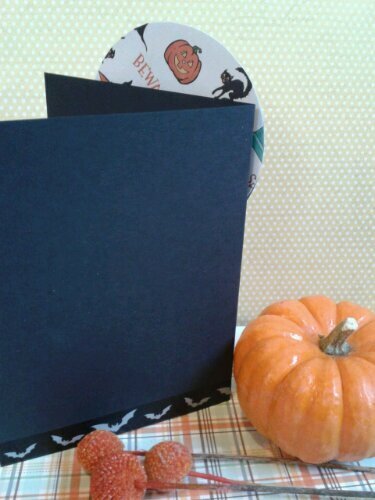 Not only did she send me one of her gorgeous cards with a wonderful note, she included some Pretty Little Studio materials–and I love their work. 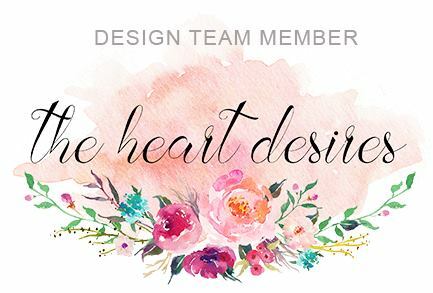 In case you don’t know Jeanne, she is on numerous design teams and has an amazing flair for color and pattern. 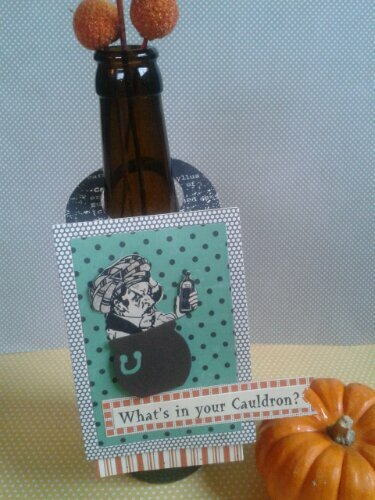 Her cards just pop out of the screen, and are even more delightful in real life. Please pay her a visit! These are just a few of my favorites of hers, seasonally appropriate! Click on image for more information. I couldn’t get this card out of my head last year! It has inspired my current creation for sure! And this little guy! Agh, so cute! 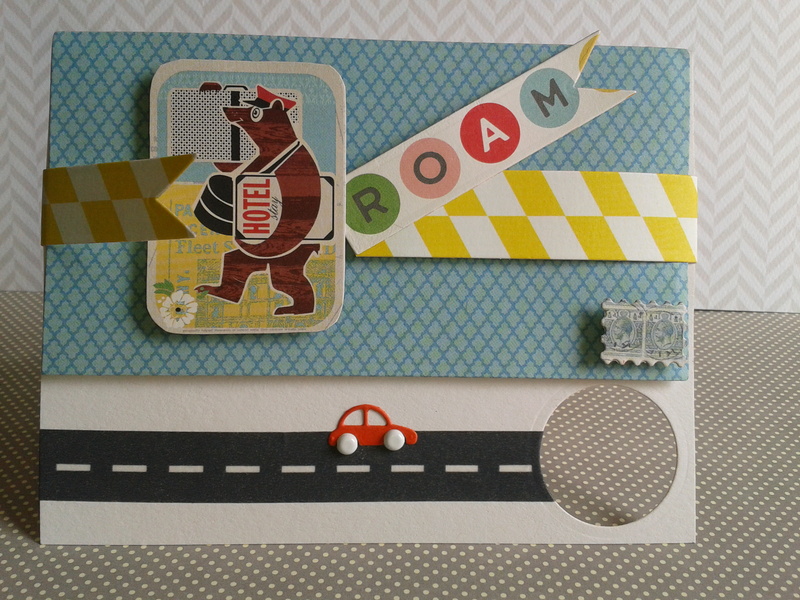 The amazing card she sent me! I have been working, as usual, behind the scenes quite a bit on different pieces, but haven’t had much time to write and post the work. I finalized this card last week, inspired by Fusion’s latest challenge. There are some AMAZING entries (as usual) from the design team and players this week! Go check them out! I integrated most of the imagery in the photo, including the branches and the mini candelabra, and manipulated the sketch a bit. 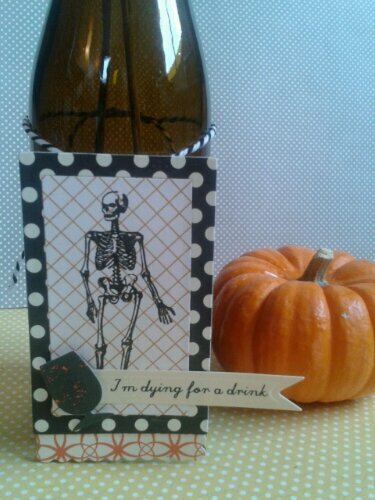 The inside sentiment is from Waltzingmouse’s Halloween set released last year. 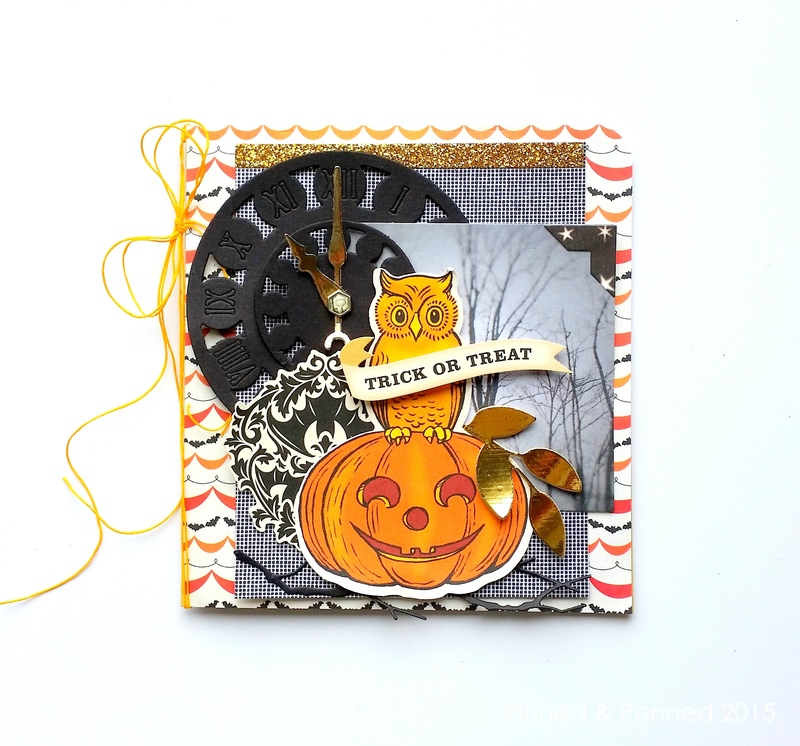 All of the ephemera is from an old American Crafts set; I die cut the clock (Crafter’s Companion), branch (Memory Box), and leaf sprig (Maggie Holmes). 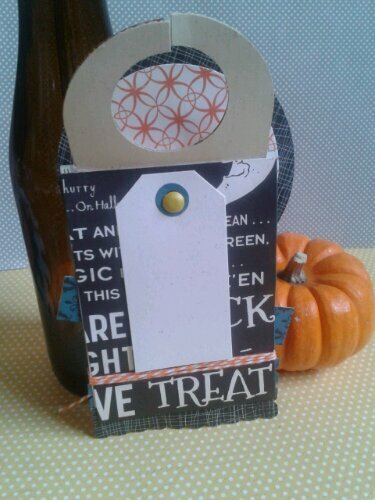 The papers are old October Afternoon, and the base is one of my favorite cardstocks, “Fuse” by MFT. 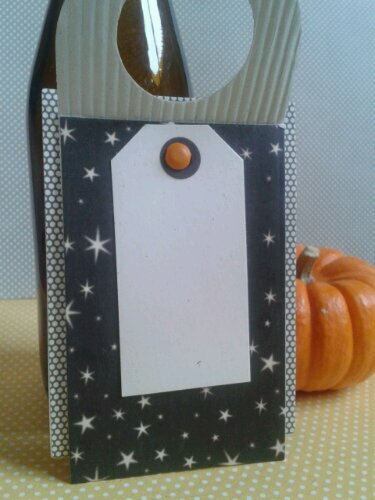 I am not a big twine or ribbon user in my cards, but I do love the look of that moldable wax twine as a finishing touch sometimes. In the next few days, as the moon becomes full and the veil thins, I hope your world will be full of good spirits, and if you encounter any ghouls, may you find the power to cast them off. 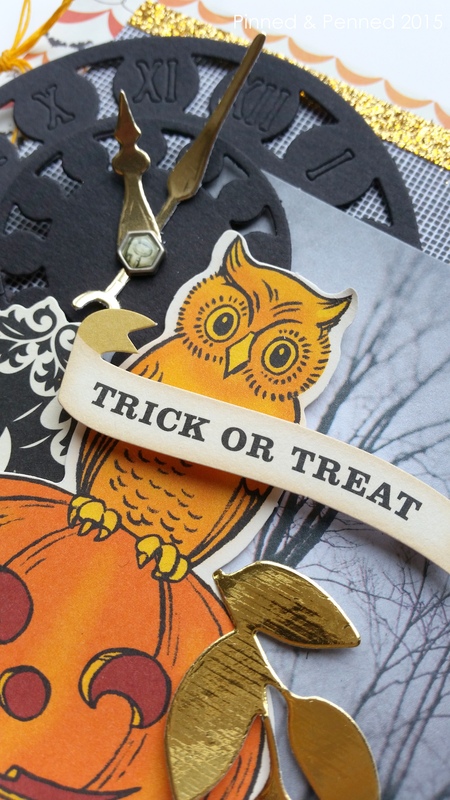 I plan to be back with some more Halloween fare before the week is out, but if not, enjoy this enchanted season and revel in the treats of Halloween night! And Away We Go: Trip # 2! 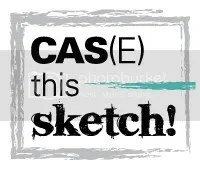 Here’s another take on the challenge at CAS(E) this Sketch! Away We Go: Trip #1! for the current challenge over at CAS(E) this Sketch! 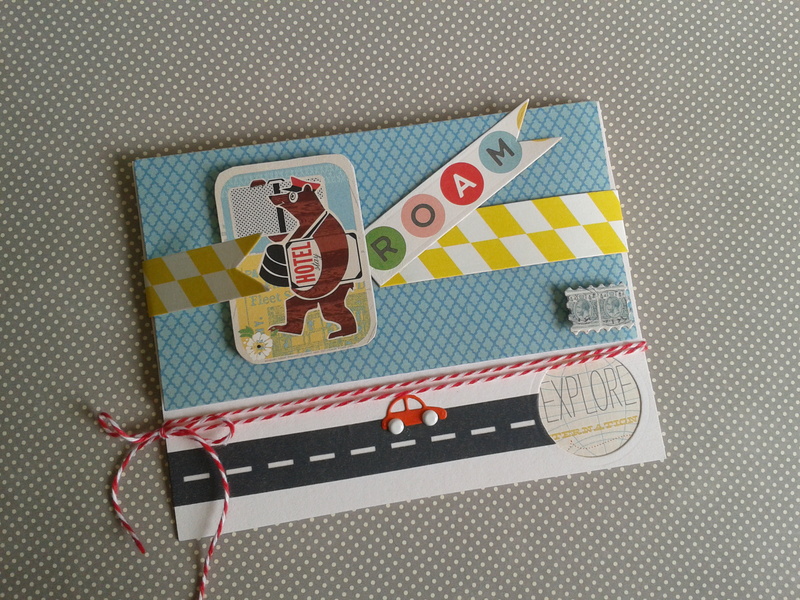 October Afternoon’s Travel Girl provided the papers and I just love those little car dies from Memory Box! 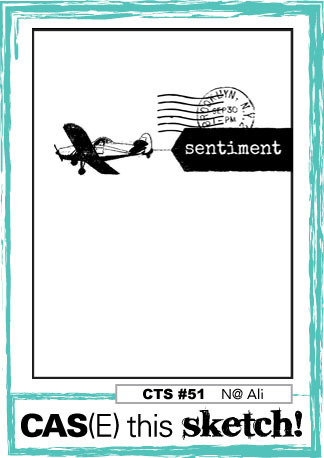 Scoot over to CAS(E) this Sketch for some really great work! Ooh, ooh, she’s got stars in her eyes and all across the sky as she rides this October night! 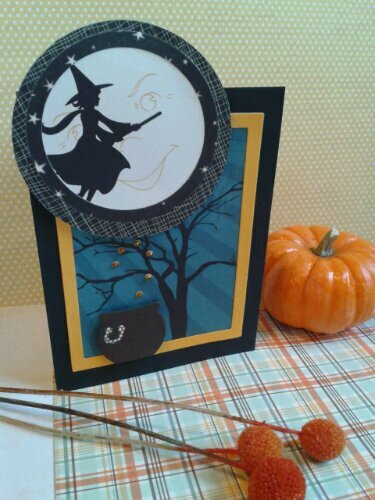 I just love this October Afternoon paper & the little lady whose silhouette reminds me of Samantha on Bewitched! 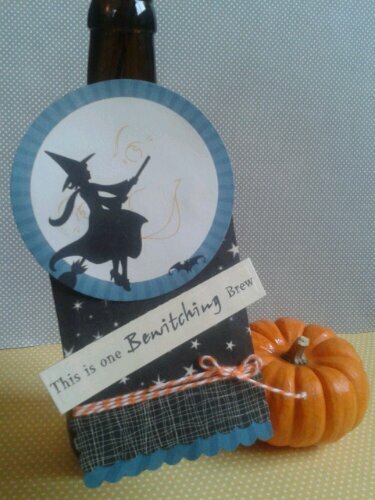 I layered several papers from the collection, used one of the papers as my background, and brought back my Lifestyle Crafts cauldron. Bubbly embellishments are from American Crafts. 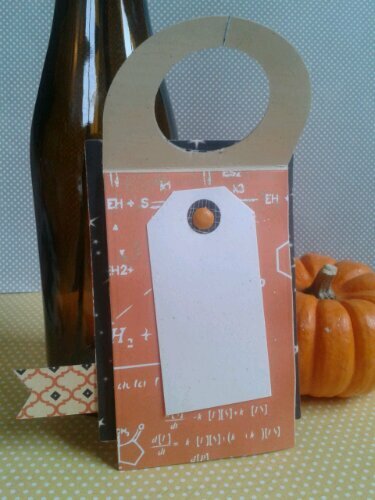 I love this Memory Box stamp which came with a little coordinating bubbling potion bottle. 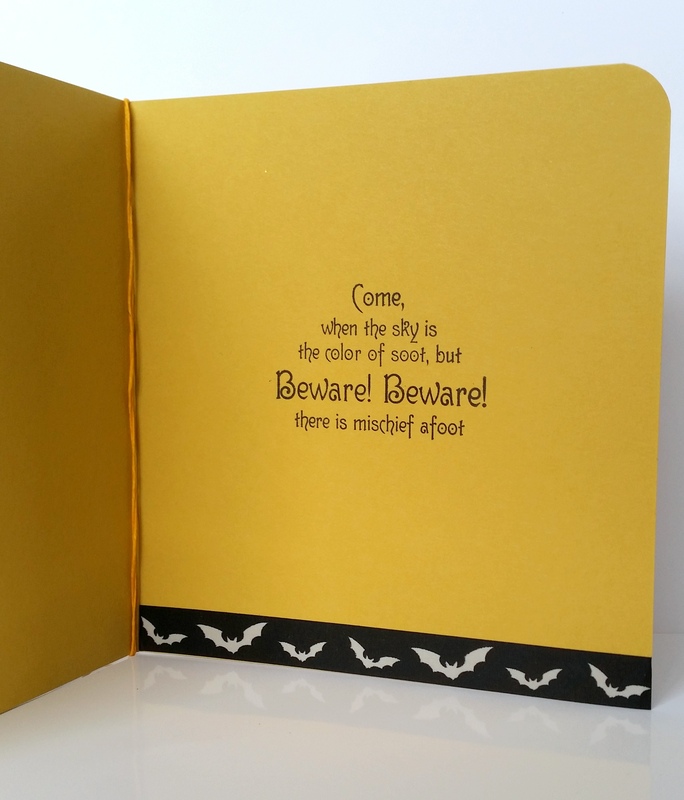 Check out all the other spooky greetings & great products at Simon Says Stamp! My partner is a beer brewer, cider slinger & soon to be cicerone at a local bottle shop and bar here in Seattle. 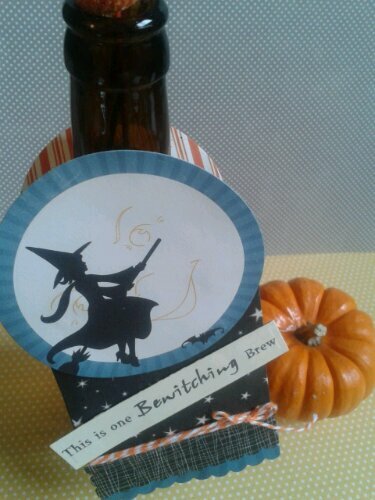 So I have quite a few beer & wine inspired ideas that are a-brewing and spilling over in my mind! Now I just need to hop to it and execute them all! Here are the first in what will be a series! 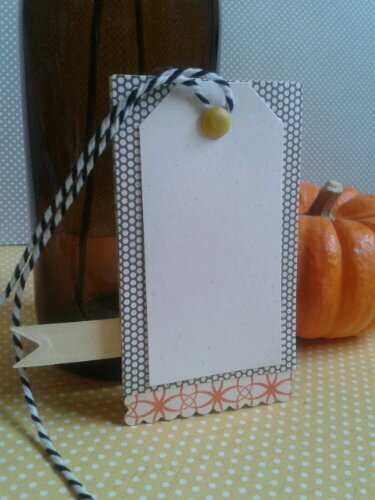 It’s tag mania here at Pinned & Penned! These actually have been completed for a couple months now, but I am just getting around to photographing and uploading. They were pretty labor intensive to make, as they are multiple layers, with a mid-layer of corrugated paper to make them nice and durable! 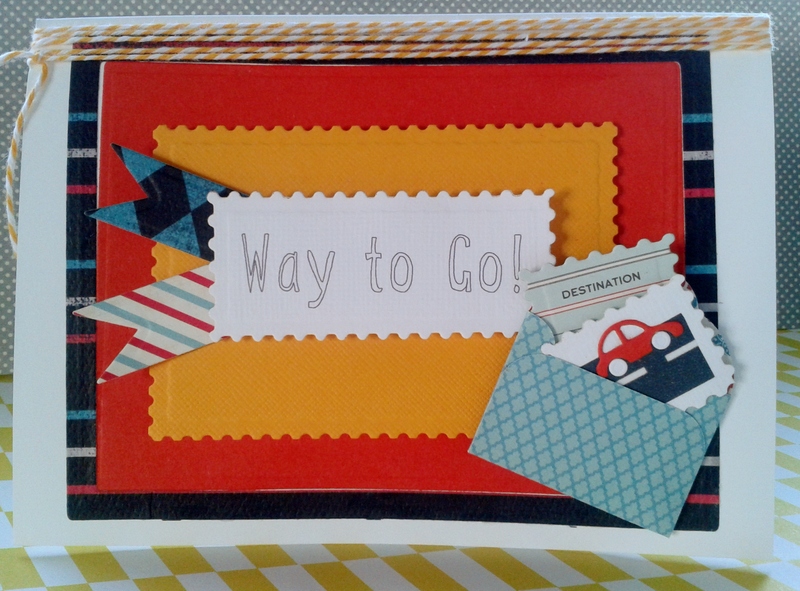 But I love how they turned out with a combination of fun paper layering, framing, stamping and embellishing! 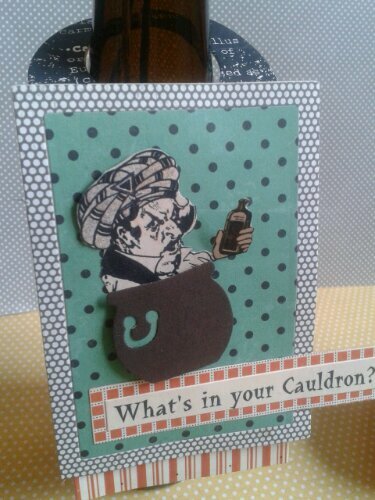 The wine bottle die is from My Favorite Things and our little snake oil man here is popping out of a Lifestyle Crafts cauldron die. Don’t you just love both? All papers are from last year’s October Afternoon release. 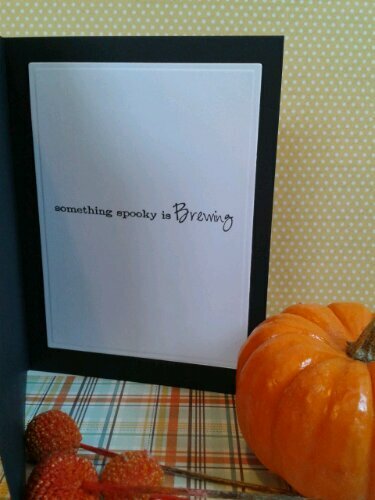 My sayings were composed using a variety of fonts and printed on cardstock. 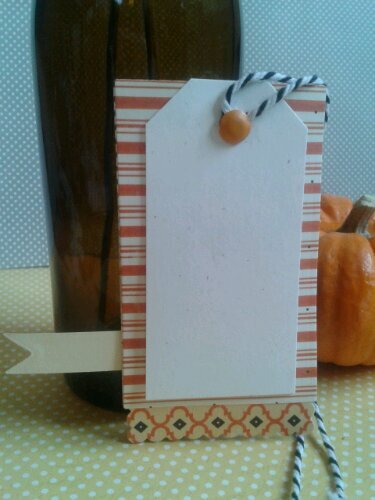 For this tag, I initially used my Crafter’s Workshop birch tree stencil with Distress ink. 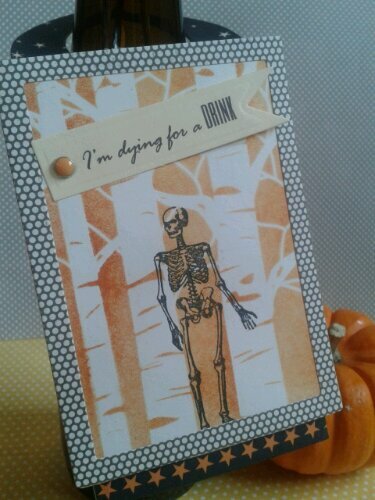 Then I stamped one of my favorite skeleton images (from Victorine Originals). Poor guy! He’s been holding on, empty-handed, so long for just a drop of liquid hops! These are smaller versions that can accompany a six-pack! He is still thirsty, yet that glass is so close! Thanks for viewing! I would love to hear your feedback and connect with you! 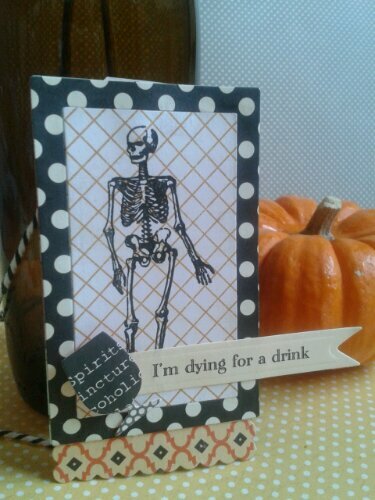 Happy drinking, tricking, treating and haunting! P.S. Let me know if you would like any advice on pairing beer with your seasonal dishes!